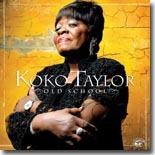 The Queen of the Blues, Koko Taylor, is back with her first CD in seven years, and she's sounding as strong as ever! It's our Pick Hit this month, with two reviewers weighing in with their opinions. Rough and raw Mississippi Delta blues comes from Terry "Big T" Williams and Wesley "Junebug" Jefferson. Great nicknames, too! Their CD, Meet Me In The Cotton Field, is this month's Surprise CD. We look back at one of the many excellent CDs released by now defunct Black Top Records in the early '90s. Bobby Parker's Bent Out Of Shape is featured in this month's Flashback section. Our What's New section features a wealth of new releases, including discs from Jimmy Hall, Tad Robinson, Howard and the White Boys, Denise LaSalle, Ken Tucker, Magic Slim and the Teardrops, Mojo Watson, Ernie Southern, Randy McAllister, Lady Sunshine and the X-Band, and more, plus a reissue of Roscoe Shelton recordings and a DVD spotlighting the career of piano legend Pinetop Perkins.